Red Oak Parks and Recreation Commission’s Red Oak White and Blue: The Oaks Fellowship Church. June/ July, 2016. An evening of food, fun and watching fireworks sponsored by Citizen’s National Bank. No charge. Red Oak Parks and Recreation Commission’s Easter Egg Hunt: Watkins Park, April 2016. No charge. Red Oak Chamber Founder’s Day: Watkins Park. September 2, 2018 9:00 am – 3:00 pm. Parade, food, and all sorts of activities for the whole family. No charge. Red Oak Parks and Recreation Commission’s Fall Festival: Watkins Park, October, 2016. The Parks and Recreation Commission and The Oaks Fellowship team up to create a safe atmosphere for children to play games, eat candy, go on a hay ride, win prizes and have fun. No charge. Red Oak Parks and Recreation Commission’s Christmas in Red Oak: Watkins Park , December, 2016. Activities from 11:00am – 2:00pm and a parade with Santa, hay rides, vendors, and much more. No charge. 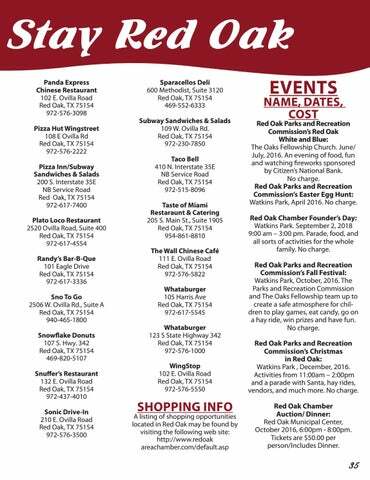 Red Oak Chamber Auction/ Dinner: Red Oak Municipal Center, October 2016, 6:00pm - 8:00pm. Tickets are $50.00 per person/Includes Dinner.